The lady had walked past me as I sat on a curb taking pictures of flowers, the rattling of her tartan trolley bag's plastic wheels audible over my headphones. "Excuse me." I looked up. Her voice had the lilting accent of a birthplace far away. She was an older lady, with greying dark hair pinned up with combs, and a bejewelled brooch in the centre of her black cardigan. "I noticed you taking photographs, and I want you to see something I found," she said, reaching into the tartan depths and retrieving a knitted mobile phone pouch. "I was just walking along thinking about my husband, who died in 2002..." - her voice broke - "...and I found this on the road." I looked down into her hand. "I thought it was a sign, because he had a terrible death, and if I had just prayed more, I could have done...."
Tears rolled out of each eye. "Oh no!" I exclaimed. "I'm sure it's not that, I'm sure you did everything you could!" "But this, I found this, just as I was thinking about my husband." Soothing spontaneous pavement grief by invoking the greater plan of a higher being is not something I'm used to. "I'm...I'm sure it's a good sign. That's a palm cross. They make them on Palm Sunday, then burn them for Ash Wednesday. Somebody probably just dropped one. I'm sure if it's a sign of anything, that your husband's in a good place." Her eyes filled again. "I'm sorry to cry..."
"That's all right! It's OK!" I reached out and tentatively patted her upper arm. "Look, I will take a photo." She held out her hand, and I snapped the picture. "And the floods, I feel so bad about the people, and I can't help because of my age. And I've had two operations..." she trailed off. "Well there's a lot of horrible things in the mud, and they wouldn't want you to get sick on top of everything else," I said. "But I could work, I could clean things," she croaked. "I feel helpless." "I know, I know how it feels, but there's so many people helping, they can't handle them all." The lady wiped her eyes. "I'm sorry to take up your time," she said. "It's no problem! Please don't feel bad," I replied. "I'm going this way anyway, I'll walk with you." "I'm Maria," she said by way of introduction, holding her hand across her brooch. "Natalie," I replied. Maria told me she was on her way to visit her daughter, a Fine Arts student, in a nearby street. "Where are you from originally?" I asked. "Austria," came the answer. "Oh! My Grandad was Polish," I said, seizing on something a bit nicer to talk about as we walked. "Ah, yes, you have a Polish face, I see now," Maria said, the wheels of the trolley bag rattling on the bitumen. "It's the cheekbones." "You know, I'm 70, and I never felt my age," she said. "But a few years ago I had two operations, and ever since I've been feeling my age. But I am determined to keep doing things." I agreed that was important. "I used to be so young, and I never realised. But I'm very happy I have led a full life, and done lots of things." We reached the end of the little tree-lined lane that ends near my front door. "This is where I'll have to leave you Maria - are you right to get to your daughter's?" "Oh yes, it's just over there," she gestured with her right hand, as her left hoisted the handle of her tartan carrier. "Well, it's been a pleasure meeting you Maria." "Thank you Natalie. I am sorry to share my tears with you." "Oh no, don't be silly! But please don't feel bad. It was a good sign." "Yes," she smiled. "It was, it was a good sign." And she turned and walked away, the plastic wheels rattling as she went. I love this!... You know it's momments like these that rattle one's spiritual bones and reminds us that life is bigger than the "daily grind!" Impressed that you didn't try to give this moment any dramatic meaning, but just let it be! Lovely. It's really sweet of you that you talked to Maria and made her feel better. Usually people go away and don't care. Starlight sent me here. Beautiful post. I love that you managed to reassure her in the midst of everything that was going on. That's really touching. She's even still wearing her wedding ring in the photo. I wonder if anyone feels like they've done enough when there's so much to be done. Very moving. Thank you for sharing this. Damn it! i was just settling in to a comedy riff and I stumbled into this. but now I'm very bloody glad I did. That is one sweet story, well written. This was completely inspiring. A thousand little things recently have been restoring my faith in humanity. This was one of them. Thank you very much for your comment on my blog, it was not only extremely kind of you but also very encouraging and helpful. I love your blog and recommend it to my newer blogging friends often. Keep up the great work. Loved-Loved-Loved it. A great reminder to slow down and take the time to talk with someone, perhaps even take a walk. 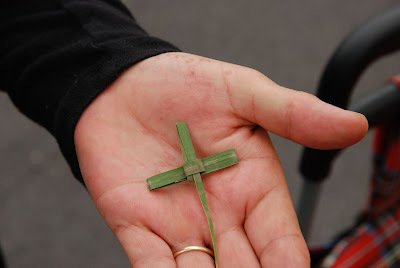 I loved the photo of her hand and the cross. Beautiful! Wonderful story! It is amazing the moments and opportunities that life hands us when we are open to seeing them. The random touching of one life to another. And, although the story is mainly about your touching her life and helping her...the effect is always mutual. I am sure you got much from the experience as well. What a lovely little exchange.